The TLP 2824 Plus monochrome desktop thermal printer comes equipped with serial and USB ports, prints 4" per second in black at 203 dpi, and can be used to print barcode labels or other media up to 2.2" wide. This desktop printer can serve as a direct thermal printer, which heats thermal paper to produce the print, or as a thermal transfer printer, which heats a ribbon to produce the print on the paper. Direct thermal/thermal transfer printers use heat instead of ink and are typically smaller, quieter, faster, and more energy-efficient than dot-matrix printers. The TLP 2824 Plus is compact for installation in limited spaces and it is ideal for printing small labels. It can print up to 4" per second at 203 dpi (dots per inch) and prints labels up to 39" long. The 32-bit processor combined with the 8 MB of SDRAM memory and 4 MB of flash memory offers faster first label printing with extensive media graphics. EPL and ZPL programming languages are standard. The printer is Unicode-enabled and can print text in different languages. The TLP 2824 Plus printer's double-walled casing is made of ABS (acrylonitrile butadiene styrene), which helps resist impact. An open-access design facilitates media loading. Serial and USB ports allow connectivity to a computer or other devices (cables sold separately). The printer automatically detects installed media and calibrates to the media type and length for accurate printing. A reflective sensor allows the printer to identify the gaps, holes, notches, or black marks between labels to print the labels accurately. A transmissive sensor enables it to detect when a roll of media has run out. An odometer can be used to track the print length. The reset button can be pressed and held to restore the printer to its default settings. The auto-detectable power adapter can accept AC power between 100 and 240 volts. This product is suitable for use with black bar, black mark, continuous, continuous receipt, die-cut, fanfold, gap, notch, notched, notch-sensing, perforated, receipt, roll-fed, tag, or tag stock media (all sold separately). The maximum outside diameter for rolls is 5". * H is height, the vertical distance from the lowest to highest point; W is width, the horizontal distance from left to right; D is depth, the horizontal distance from front to back. Label printers, also known as label makers, can be used to print labels, tags, receipts, and other similarly sized media. Direct thermal and thermal transfer label printers use heat instead of ink to print on coated thermal media. 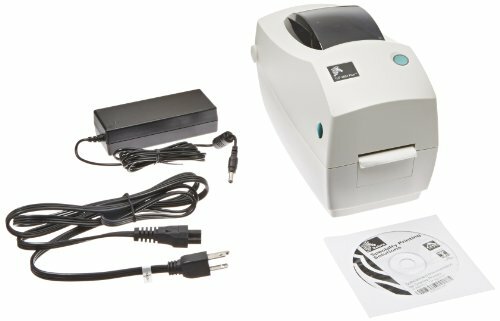 A parallel, serial, or USB port allows a label printer to be connected to a computer. An Ethernet port or wireless capabilities may enable it to be connected to a computer network. Label printers can be used in a variety of commercial environments, including warehouses, laboratories, retail stores, health care facilities, and shipping and receiving facilities.